A few weeks ago I noticed a deer– a doe– laying down, tucked back in a group of mixed pines that are at the edge of the driveway in front of my studio. Something seemed amiss here. Too still and not looking back at me when I stopped walking to gaze in at it. Moving closer I discovered that it was dead. There were no obvious wounds which was my first thought. Bow hunting season had opened recently and perhaps she had been hit and made it to this spot. 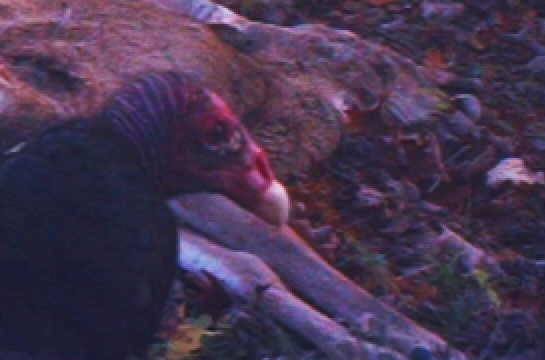 But looking closer there were a couple of scrapes around her face and neck. Most likely she had been hit by a car and found her way to this quiet little glade to succumb. I’ve watched many groups of deer around my studio over the past decade and have witnessed many of them grow up in this comfortable safe space. I watch them playfully bounce around, often running crazily in circles around the studio. I watch them graze at the grass and undergrowth. Watch them sleep out in the lawn. Watch the males test their strength with their new antlers. One even sleeps up next to the foundation wall behind the scraggly hedges at the front of the studio. I appreciate their struggle to live as a wild creature among humans. It’s hard enough for those of us who are somewhat human. 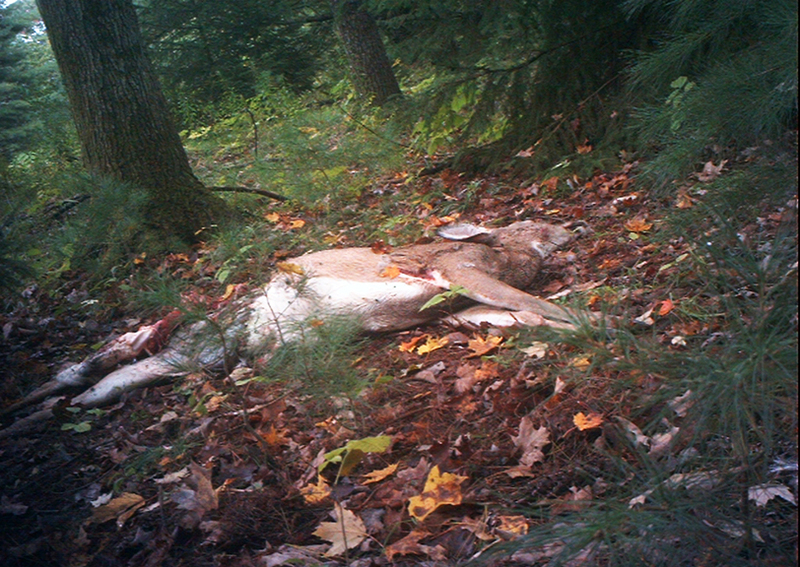 And while I understand the place of death in the cycle of life, seeing this poor dead doe made me sad. It also made me wonder if I should do anything with her body. It was pretty close to the studio and I worried that it might create an odor. I’ve been around enough of that stench of death to know I didn’t want to wallow in it for an extended period. Maybe I should get a bag of lime? Bury it? In the end I left it where it was. 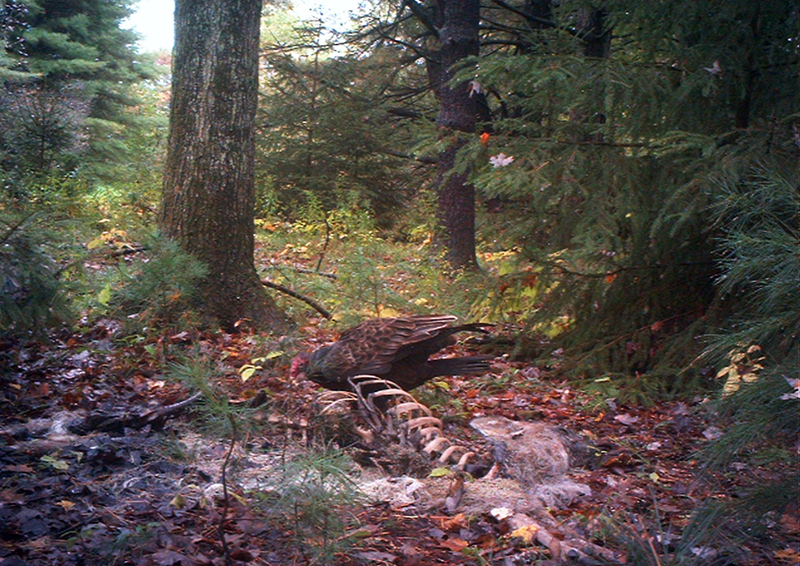 A day passed before I set up a trail cam to capture whatever came to visit.The carcass had been moved a bit and the rear haunch had been eaten at. The belly was open now and the organs exposed. 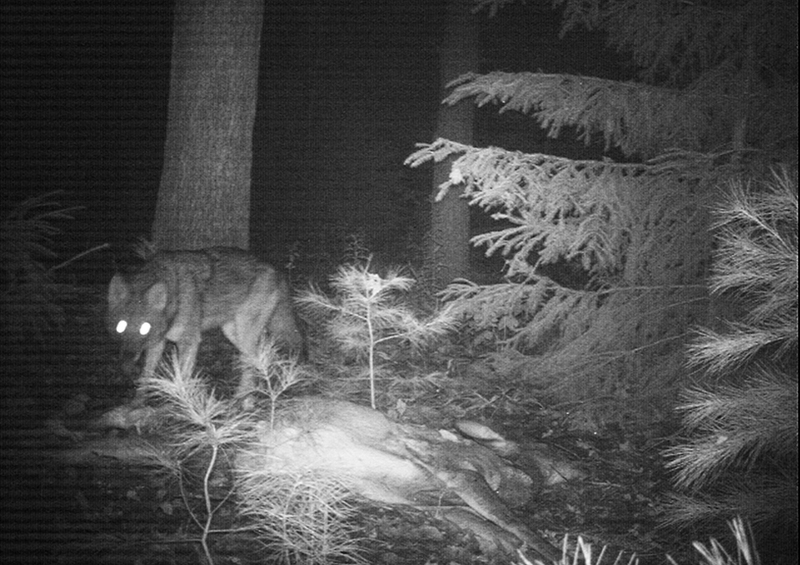 The camera was setup and revealed a few visitors. But only a few. Less than I had anticipated. 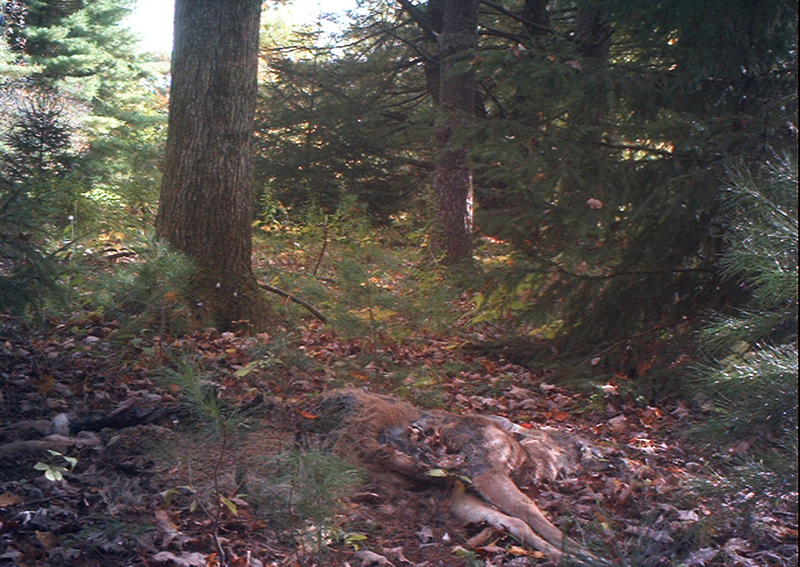 The first two nights brought a single coyote who ate a bit at the rear haunch. Most likely it was the one who had moved the carcass. The third day brought a couple of crows who worked at a spot behind the front leg. At this point, the open belly was writhing mass of maggots along with an army of beetles that ran to and from the body, grabbing bits of it disappearing under leaves with their precious cargo. I did not take pictures of the maggots or the beetles. 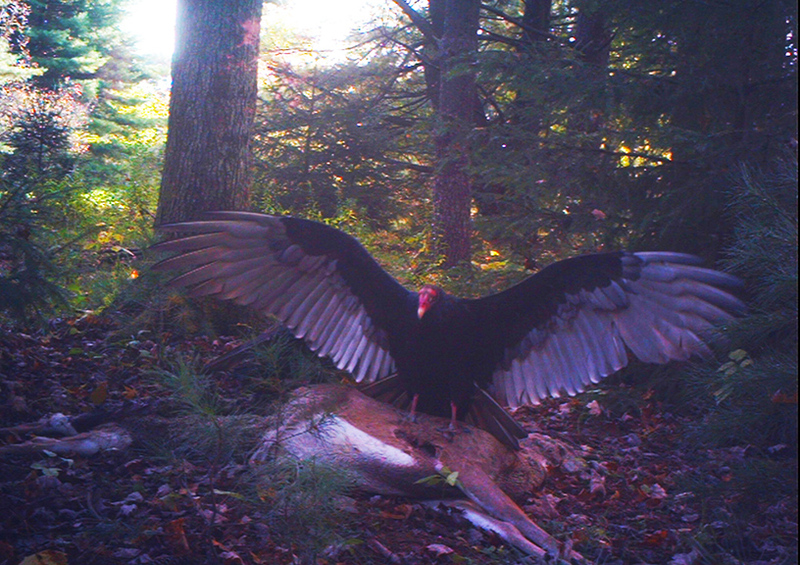 On the next two days the turkey buzzards came. If you have never seen buzzards up close, they are an impressive bird the size of an eagle with a huge wingspan. Walking down my driveway on one of these days, there were 7 or 8 of these guys in the trees around this spot. Watching them flee through the low pines, trying to avoid the many branches, with their majestic soaring way of flying was thing to behold. They did quite a job over the time they were there although nothing compared to the constant around the clock erosion caused by the maggots and beetles. This guy below acted like the king, showing off his wingspan chasing off the others at times. 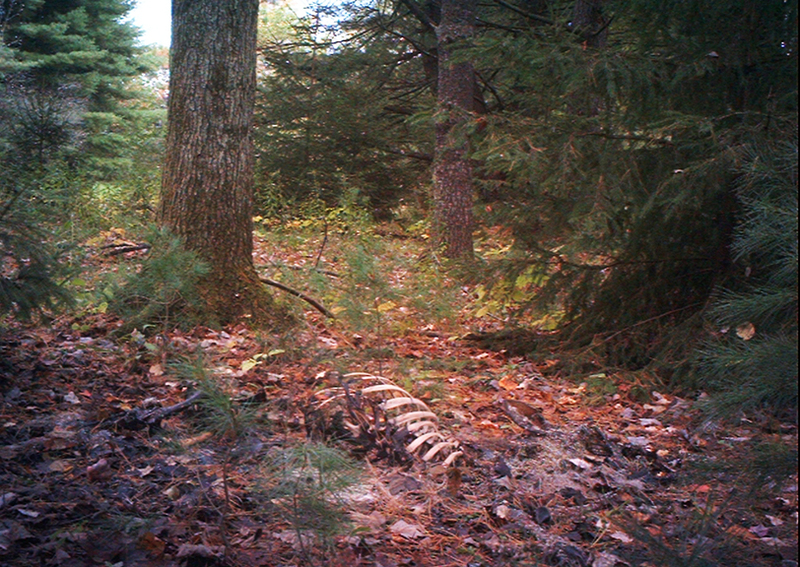 Below is the deer at the end of five days from when I first set up the camera. Below is the next day. 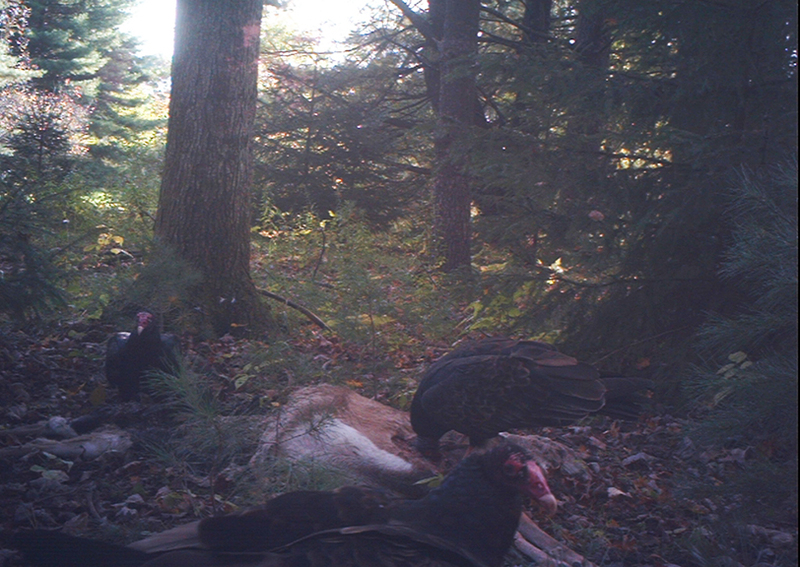 The turkey buzzards came for one last quick nosh. You can see how much work the maggots and beetles accomplished since the last photo above which was taken only 24 hours earlier. They are at it constantly. Below is at the end of seven days. Little remained but bones, a bit of hair and hardened skin around the skull. 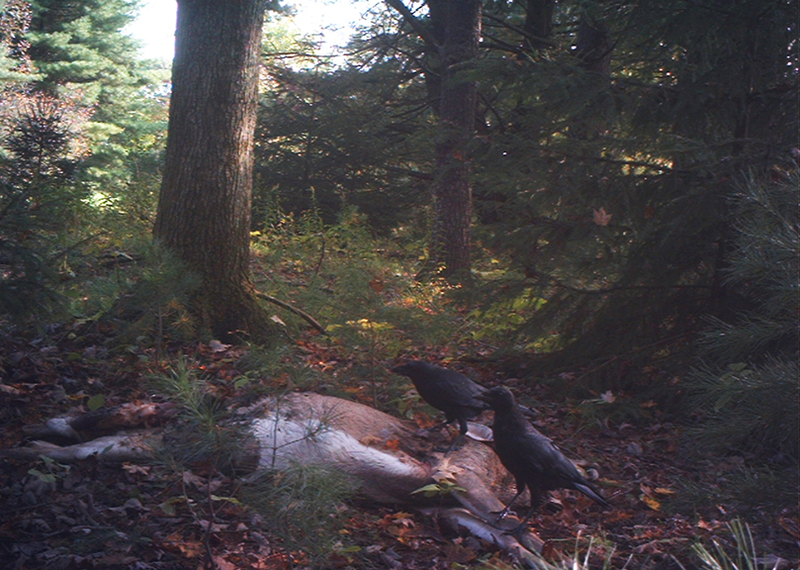 Thanks to scavengers, large and small, most of the deer had made its way back into the cycle of life. If this had been further up in the woods, the bones might even be gone by now. The odor was surprisingly limited. It didn’t emanate in waves that went out in all directions. Rather came out in narrows bands that would move in whichever direction the air was moving at the moment. Sometimes I could walk up the carcass and barely smell a thing from it even as I stood mere feet away. But walking away around the corner from it, maybe a hundred feet away from it, I would cross through a band of pure stink that might be twenty feet wide. Once through, no more smell. After about five days the odor was nearly gone altogether. As sad as it made me, it was an interesting thing to witness. It gave me a closer glimpse into the cycle of life, how the death of one creature can perpetrate the life of another. We don’t often get to see that firsthand so I feel lucky in an odd sort of way.